Closed cell polyurethane foams are plastics created of bubbles that are continuous and completely spherical or oblong. Polyisocyanurate foams (or “trimer foams”) are generally low-density, insulation-grade foams, usually made in large blocks via a continuous extrusion process. These blocks are then put through cutting machines to make sheets and other shapes. They are made in high volumes at densities between 1.8 and 6 lbs. per cubic foot. Although reasonably inexpensive, they have a stiff, brittle consistency, and they typically shed dust when abraded. Isocyanate foam polymers, while not as heavily cross-linked as polyisocyanurate materials, offer some cost advantages for users. Polyurethane foams are considerably different and more useful in composite constructions. Polyurethane foams are made in large blocks (often referred to as “buns”) through either a continuous-extrusion process or in a batch process. The blocks are then cut into sheets or other shapes. They may also be individually molded into discrete part shapes. Integral-skin foams, or self-skinning foams, couple a high-density skin and a low-density core. They can be formed in either an open-mold process or a closed-mold. In the open-mold process, two reactive components are mixed and poured into an open mold. The mold is then closed and the mixture is allowed to expand and cure. Foam densities range from approximately 3 to 50 lbs. per cubic foot. Unlike thermoplastic foams (PVC, SAN), the unit cost of polyurethane foam increases in a linear fashion with density, so a 20-lbs.-per-cubic foot polyurethane foam will be approximately twice the cost of a 10-lb. foam. Foams of the same density can vary considerably in strength, depending on the foam production process. Different production methods require different chemical formulations and foam curing temperatures. General Plastics’ self-skinning / integral-skin foams allow items such as aircraft armrest padding to be easily removed from the mold in the exact shape needed, and already painted or airbrushed in the desired color. If flammability is a concern, find out what kind of blowing agent is being used to create cells in the foam: Many producers use carbon dioxide (a byproduct of the foam-making chemical reaction) to create cells in their foams. Other producers have changed blowing agents in their low-density foam manufacturing processes. Switching from chlorofluorocarbon (HCFC, HFC) to pentane can negatively impact the foam’s flame resistance. General Plastics’ premier closed-cell rigid, flexible and self-skinning polyurethane foams are used for high-performance applications by original equipment manufacturers, particularly in the aerospace, defense, marine, nuclear and other industries. Typically, they are used in tooling and mold making; as composite core and prototyping material; for protection of explosive or radioactive materials; and as a wood substitute for dimensional signs, displays and sculptures. General Plastics is certified to ISO 9001:2015/AS9100D and meets NQA, MIL-1-45208A and MIL-P-26541 requirements. Our aerospace-grade foams are satisfy such specifications as Boeing Company D6-82479, BMS 8-133 and FAR 25.853. If you require additional information regarding our certifications and qualifications, please call us. Depend on our products for absolute consistency – block to block, board to board, batch to batch. All General Plastics products are manufactured in the United States in Tacoma, Washington. Foam buns undergo an extensive stress-relieving process to eliminate warp and/or bow. Expect consistent density throughout sheets and buns – density gradient is less than +/- 10% of nominal density, and frequently closer to +/- 5%. Precise bun trimming and horizontal band saw cutting creates cut sheets that are square and true. Does not oxidize, degrade, crack or change in chemical properties over time. Depending on the density of the foam, our standard sheet sizes are 48” x 96” and 18” x 100”. We can supply buns up to 30″ x 48″ x 120″ in size, depending on foam density – inquire about custom block size availability and cost. We can provide machine tolerance from .005″ to 0.060″. LAST-A-FOAM® products are CFC- and VOC-free. They do not emit toxic fumes or leach chemicals into surrounding soil. There are no halogen additives to cause toxic gas emissions in fire conditions. The material is biologically and chemically inert, so it does not support fungus or attract rodents and insects. Many of our foam products are flame-retardant and self-extinguishing. General Plastics manufactures commercial high-density foam products that are eco-friendly. Our “green” content combines post-industrial, post-consumer and rapidly renewable material resources. Find green content in General Plastics’ LAST-A-FOAM® FR-4500, FR-7100 and R-9300 foams series. The percentage of green content varies by product line and density. In the 50 lb. density, each sheet of our FR-4500 foam diverts the equivalent of 512 water bottles from landfills. Our R-9300 Continuous Insulation Series foam blocks for industrial and cold-storage building construction applications may contribute to LEED certification with material containing up to 11% green content. For full details on these aspects of working with our HDU materials, please refer to our User Guide to Tooling and Molds. LAST-A-FOAM® products are easily bonded using numerous adhesives. Boards and blocks or buns can be bonded to each other to create oversize pieces for large-scale projects. The polyurethane foam can also be bonded to metals, using a two-part epoxy. 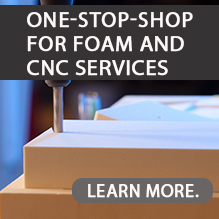 LAST-A-FOAM® with a density of 10 pcf or less can be cut and carved with common woodworking tools. Foams with a density greater than 10 pcf may require power tools. All of our products may be CNC-milled. Our flexible foams are white, and most of our rigid foams are yellow. Depending on the quantity, we can also formulate specific colors. Be aware that exposure to UV lighting will darken the exterior color of these foams. If appearance is a concern, we recommend painting them with an opaque coating. Our polyurethane foams accept any paint finish and absorb very little paint. Recommended coatings include automotive or woodworking grades. For outdoor use, acrylic-latex paint or enamel works well. Our foams can also achieve a plated-metal surface using an electro-less plating process. Refer to our technical data sheets (TDS) for thermal properties of our foams. Note that these numbers are approximate, and we recommend that you test the product for your particular application.